Powers/Abilities: Admiral Gannon is a trained military commander. (Order I#1) – Admiral Gannon commanded a United States Navy fleet of ships. 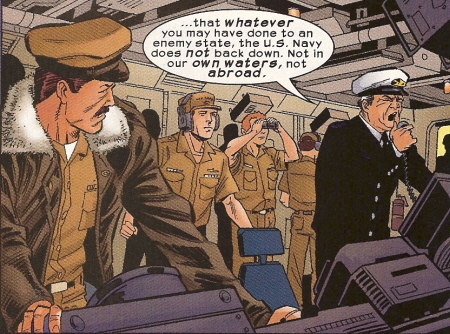 The Defenders (Doctor Stephen Strange, Hulk (Bruce Banner), Silver Surfer, Sub-Mariner) ordered the ships to stand down and return to base or be destroyed, but Gannon, appointed by the U.S. Secretary of Defense, refused to do so. The Defenders, calling themselves the Order, sunk the fleet in short work. Comments: Created by Jo Duffy, Kurt Busiek, Matt Haley, and Dan Panosian.